* Mariell's shimmering Clip-On 1 1/4" h x 3/4" w Cubic Zirconia Earrings have a brilliant cluster of Marquis stones in a curved shape to beautifully frame the face. * Plated in rhodium with a french pierced backing, these gorgeous wholesale clip earrings will make a statement with any bridal, mother of the bride or bridesmaids dress! 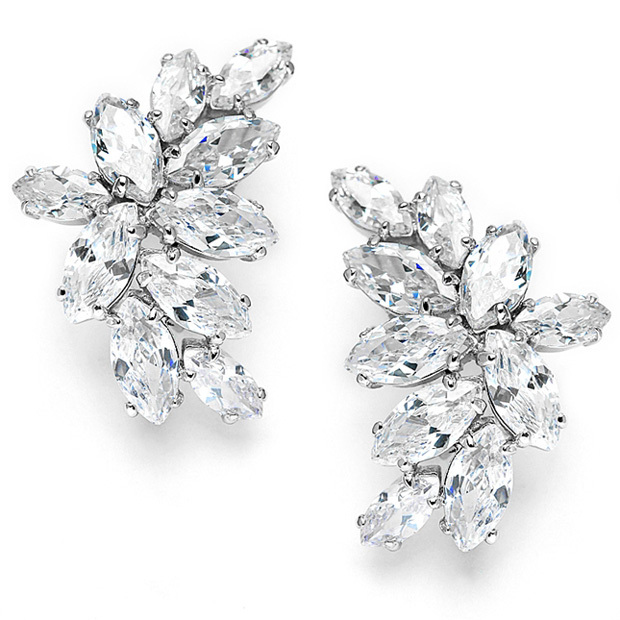 * These CZ clip earrings are a must have for any special occaision retailer! * The earrings are curved to frame the face with illuminating shimmer. * These gorgeous earrings accessorize any bridal, mother of the bride, bridesmaids or pageant dress!